1st Wedding Anniversary Achievement Get! So, yesterday was one year since I got hitched to my wife. 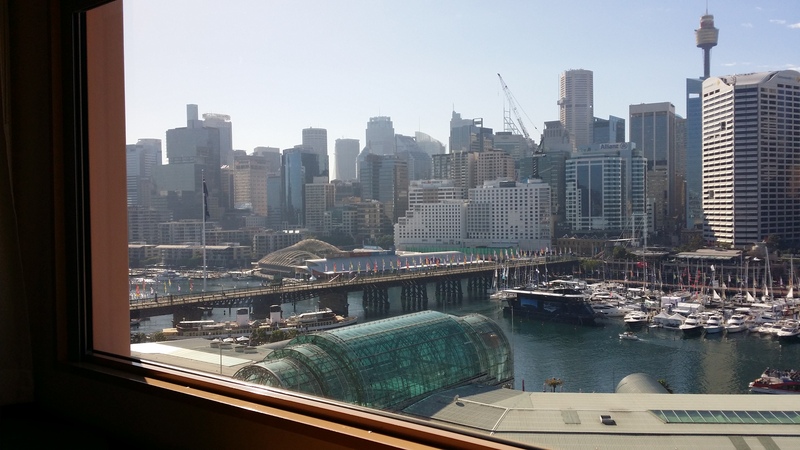 We’re still incubating our ankle-biter for a few more months, so we were free to head into Sydney for dinner, ballet (watching only, though more on my dancing later), and hotel rooms with epic views of Darling Harbour. We started our date with a bus ride (no driving, so drinking, YAY! For me only of course), with a cannonball driver who completely failed to pull over for one young woman’s stop. He didn’t get what I was yelling about either. Next stop, coffee number three at the QVB, and I somehow convinced the wife that Galaxy Bookstore would be a good idea. I bought a paperback of Hounded, by Kevin Hearne. Did I mention how awesome I am at staying on track during romantic outings? Oh, and extra points if you’re on pointe. Tried it out on my way to the bathroom last night. And that’s my being-a-good-husband done for the year! Word count is at 109,602. I hacked most of that chapter that I was working on, and I’ve got a few pretty cool ideas for how I’m going to tie up the rest of it. It’s proving to be easier than I’d thought, kind of like the last pieces of a jigsaw puzzle: because so much of the world has already been assembled, it’s easy to find where the next bits should go. More on that tomorrow. This entry was posted in Outings and tagged Anniversary, Ballet, books, Galaxy Books, Opera House, romance, Sydney, Sydney Eisteddfod, Writing. Bookmark the permalink. 19 Responses to 1st Wedding Anniversary Achievement Get! Thank you! 🙂 it was an epic end to an epic first year. Hey dave! Congrats! I think i have to read your blog 😉 where does eisteddfod come from!? Crazy. Sounds like ur doing an awesome job being a hubby so daddy shouldn’t be too hard 🙂 when are you due? Anyway hugs from norway and my two munchkins ! Thanks! And that’d be great, though I will warn in advance: about 80% of my posts are writing related. We’re due in October. I started the blog to motivate my writing, since I figure I’m not going to get as much done after the bub arrives! You know, my wife and I started out in Norway? True story. We were both staying in Voss, part of Contiki Scandinavia. I remember the sun went down for all of about two hours! Congrats on your anniversary 😀 Mine was just a few days ago. Going on 7 years of marriage now! Sad about you not being able to dance anymore, hopefully you can still do some low impact boogie-ing on occasion. That video… bahahahhaha! The kid is such a good sport. Happy Anniversary! Sounds like you successfully showed her a good time~~ Jazz Hands! Congrats on your anniversary, D! I’m also gonna throw in a congrats for your massively epic word count. Here’s to productivity, oodles and oodles of it, before October (and beyond). And thanks for the word-count-gratulations as well.